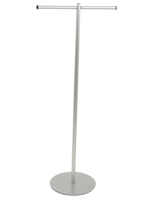 These clothing racks are a great way to display new garments in any retail store! 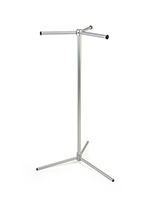 We sell many types of clothing racks & garment display fixtures! 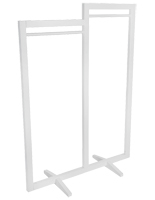 These clothing racks are perfect for retail stores. 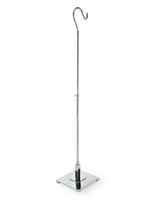 You have the capability to hang merchandise on either side. 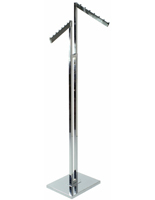 Clothing racks, like store fixtures and garment displays, are used in establishments where clothing is displayed and sold. These really are standards of the industry! 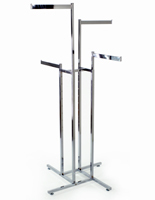 The clothing racks offer a space saving solution with adjustable arms. 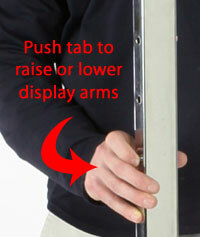 Spring-loaded push buttons allow the arms to raise and lower easily. Used everywhere in malls and stores, these clothing racks organize your floor layouts to provide shoppers with an easy shopping experience. Raise the two arms to equal heights or stagger them for a different look. 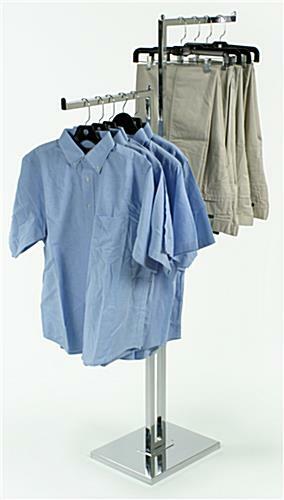 These clothes displays are ideal clothing racks that fulfill retailer's needs. Simply place the hangers on the arms, which are 33" long. The clothing racks can display many articles of clothing, depending on their thickness. The higher you raise the arms, the longer the clothing you can showcase. 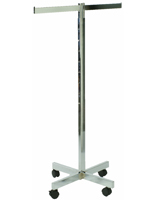 The overall height of adjustability goes from 50" to 70". 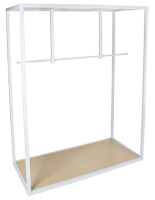 These clothing racks ship unassembled with all necessary hardware included. 15.0" x 1.0" x 12.0"